Things are changing at D+M Group, the parent company of Denon and Marantz: yes, core products such as amplifiers and AV receivers are very much still present, but the company is reinventing itself for the future. That means the adoption of two new speaker brands, Polk Audio and Definitive Technology, which D+M will be distributing in selected European countries, a much greater emphasis on network connectivity, desktop audio and Bluetooth-enabled products (from the cute little Denon Envaya speaker up to the Wi-Fi-equpped, Bluetooth-toting receivers), and the arrival of HEOS, Denon’s ambitious – and clearly very well-sorted – whole-house wireless audio system. Oh, and what was once a purely European dealer conference has expanded; for the first time, this year’s gathering – held on Spain’s Costa del Sol – saw a significant attendance from the APAC region, including Australia, Malaysia and a sizeable delegation from China. 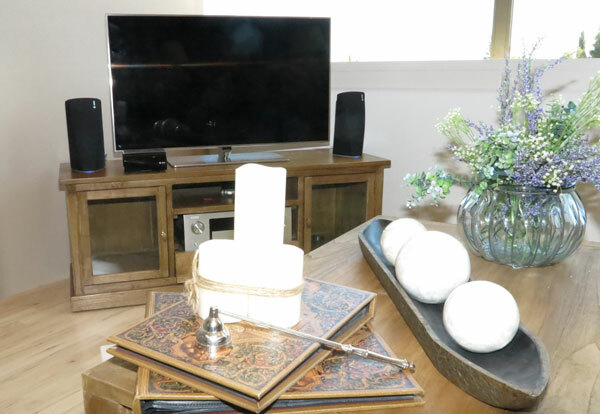 But the star of the show is HEOS, a multiroom system with Sonos very much in its sights, and part of a $25m technology investment D+M is making in 2014. Using conventional Wi-Fi (2.4GHz or 5GHz) rather than the dedicated ‘mesh’ network of the well-established rival, HEOS launches with three wireless speakers starting from around the £250 mark, a range extender, an amplifier designed to work straight into a pair of speakers, and a preamp/link unit to interface with the current and future Denon amplifiers and receivers – and of course products from other companies. 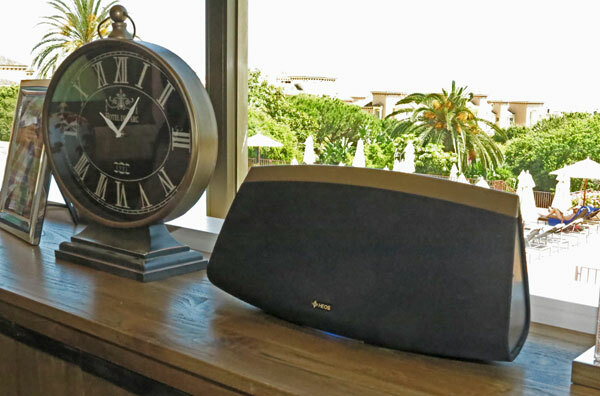 Although the two brands are still faring well with their conventional hi-fi and home cinema separates, D+M can see the writing on the wall as sales of such products contract, and wireless multiroom booms. It needs to get in, and get in fast: once people buy into a system, they lock themselves in to buying more components from that system – not surprisingly, research in the US shows 50% of buyers of wireless multiroom components buy another unit within a very short time – and if D+M is to grab a slice of that market, it needs to make sure newcomers to wirelessly networked audio are buying into its system, and not tying themselves up with a rival manufacturer. The company says it has just 12-18 months to get customers aboard its technology platform: sales lost now are lost forever, but at the same time a HEOS buyer could well turn into a customer for life, adding to and expanding their system as funds allow or their needs change. That’s why HEOS in launching in the States as soon as next month, and worldwide soon after: D+M is in a race against time – well, a race against Sonos, anyway. For Denon and its dealers, HEOS could be the gift that keeps on giving, or as D+M boss Jim Caudill puts it, ‘For every home we can convert to our technology platform, it gives us an annuity stream’. 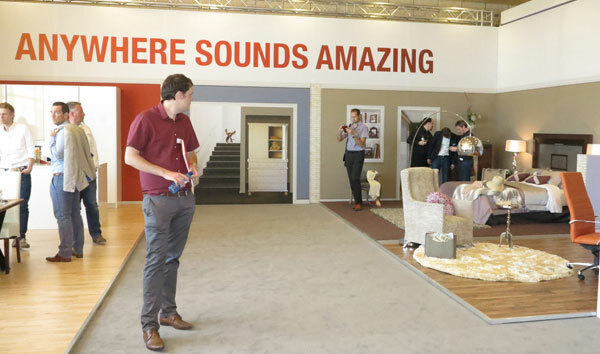 Its importance is made clear by the fact that it’s not just another product, but a brand in its own right: not the Denon HEOS system, but ‘HEOS by Denon’, and inspiring the slogan for the conference as a whole: ‘Anywhere Sounds Amazing’. In the States, research shows that 94% of buyers of multiroom systems subscribe to streaming music services, and so those figure prominently in the HEOS offering: a number are already on board, including Pandora and Spotify, and D+M will be adding more as the HEOS roll-out continues. Trial subscriptions to these services will be offered to buyers, as part of the ’90 Days to be Amazed’ campaign with which HEOS is launching: buy a second unit within 90 days of your first purchase, and you get a 20% discount. A lot of thought has gone into the packaging and ’user experience’ of HEOS – no less than three months’ work on the way the system is presented to the buyer, according to D+M’s President of European Sales and Marketing, Terry O’Connell. Denon as whole is getting a new unified look for its packaging, an enhanced website and more, and HEOS has is own packaging identity. 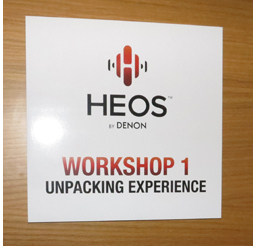 However, when I spotted that the first of several HEOS workshops laid on for us press, and for the dealers who would be following us into Marbella over today and tomorrow, was to do with the ‘Unpacking Experience’, I have to admit to a wry smile. Taking itself a bit too seriously? Not at all: we were shown how much consideration had gone into how the consumer would see and understand the product on picking up and then opening the box, and how easy it was to set up simple, or even complex, HEOS systems – up to 32 HEOS units can be run on a single network. With your HEOS purchase in front of you, and the app – for iOS or Android – downloaded, you really don’t need the instruction manual for the system, which runs to just three pages: the app takes you through true whole process. Wi-Fi settings are taken from your smart device via a cable plugged into its headphone socket, and after that everything is wireless. Indicator lights on each unit indicate what it’s doing – solid blue for linked and playing, flashing blue for establishing on network, yellows and pinks to show lack or network connection, no signal and so on – and it really does seem to take just a moment or two for a network to be set up, extra units to be aded, or reconfigurations to taken place. 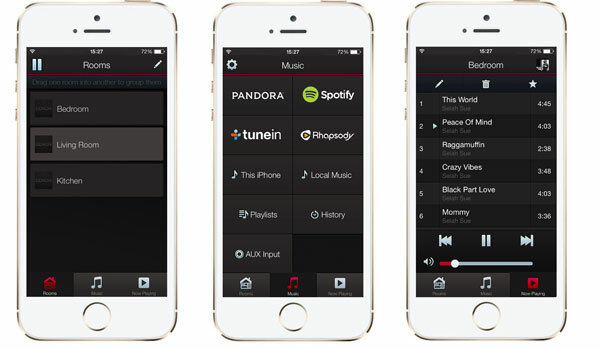 The app has a simple main interface with just three buttons, to select the HEOS device or devices in use, to choose the music to play, and to control playback. Devices can be renamed according to the room in which they’re located, used singly, paired into stereo left and right set-ups, or grouped temporarily or permanently together so the all play the same content: to do that last bit you just drag them on the app screen on top of each other. A ‘Pinch to Party’ facility allows you to pull all your HEOS units together for whole-house playback of the same source, while playlists can be built, and stored along with other preferences, in your own HEOS account. Multiple users on the network can add content to play queues as you go, and music can be sourced from Internet radio, streaming services, NAS units on the network, and even direct from your phone or tablet. In addition, a sharing facility allows one user to access content stored on another’s smartphone or tablet, and add that to the queue. USB sticks can be plugged into any of the HEOS devices – speakers, preamp or amplifier – and their content shared around the network, and the sound from digital or analogue components plugged into the preamp or amp can also be shared. HEOS does a lot, but the Denon people were open to further suggestions: I pointed out that some kind of parental or master user lock might be sensible, to stop wayward visitors or the kids interrupting your nicely-assembled play queue with a blast of whatever they feel like inflicting on you. There was a hint of that potential chaos in the ‘HEOS house’ display Denon had built at the conference, with speakers in living room, study, kitchen and bedroom sets: music from another area blasted out, overwhelming attempts to demonstrate how good the system sounded, and how its very low latency (about a thousandth that of rivals, we were told) made for fine imaging when pairs of speakers were used in stereo. All of that made it even more difficult than usual to form a solid idea of how well HEOS performs in audio terms: I certainly wouldn’t go as far as one of my more cynical colleagues, who muttered to me after only the briefest of listens in that noisy environment ‘Who’s going to be first to tell them it doesn’t sound at all good?’. But I have admit I spent the flight home trying to work out which HEOS units would work well in which room, what they could replace, and intrigued by the idea of using that preamp and amplifier unit to integrate with my existing systems, and spread the music around the house. 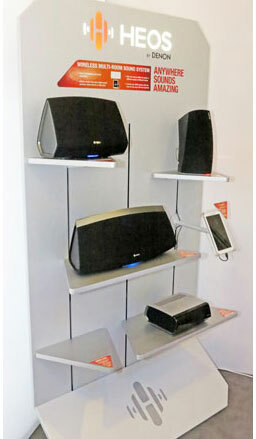 The first group of HEOS products are just that – an introduction to the system – and the hints of some more products to come suggest that Denon will be expanding it from music further into multimedia sound, to the outdoor as well as indoor spaces, and into further integration with its existing ‘conventional’ products. Already the preamp and amplifier products have both control bus and infrared control connections to interface with Denon stereo amps and receivers, so for example the preamp unit could output a fixed-level signal into your existing amp, and the app control that amps input selection and volume control when that zone is activated. 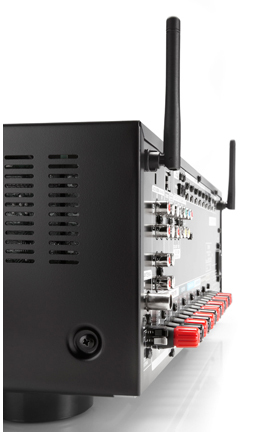 And when the question was raised whether future receivers might have HEOS built-in, so they could work directly with a network rather than needing an add-on unit – the new Denon models already have Wi-Fi capability (right) – , the reply was along the lines of ‘That would seem sensible, wouldn’t it?’, delivered with a knowing smile. HEOS is fascinating in that Denon sees it as needing to score a short-term gain – in terms of the urgency with which it must establish itself in a market already having a celebrated leader, and seeing many other players either already in the game or soon to join –, but also being capable of delivering both a long-term future and scope for serious expansion. As I said at the top of this piece, D+M isn’t giving up on what have long been its core product line, a point likely to be underscored as more of the products I saw previewed in Spain are unveiled and hit the shops. The company may be more than 100 years old, but this is a whole new Denon, undergoing a major shift – the biggest I think I’ve ever seen in a decade or more of covering this event – in its approach to the market and the line-up of products it offers. HEOS is big, very big, and it feels like a lot of future growth of D+M Group is dependent on making sure it becomes a major part of its business.